To celebrate reaching 777,300 likes on Facebook, we’re giving you the chance to win one of ten model Boeing 777-300ER airplanes in the new American Airlines livery, plus the Grand Prize — a trip on the 777-300ER itself. As of last night, they were just a few hundred short of 777,300 ‘Likes’. When they reach their goal they’ll start picking winners in a random drawing. To enter, all you have to do is visit their Facebook page, ‘Like” them, and then register for the promotion. If you’ve already ‘Liked” them, then all you have to do is fill out an entry. You’ll find the rules on their Facebook page. Go here to enter. 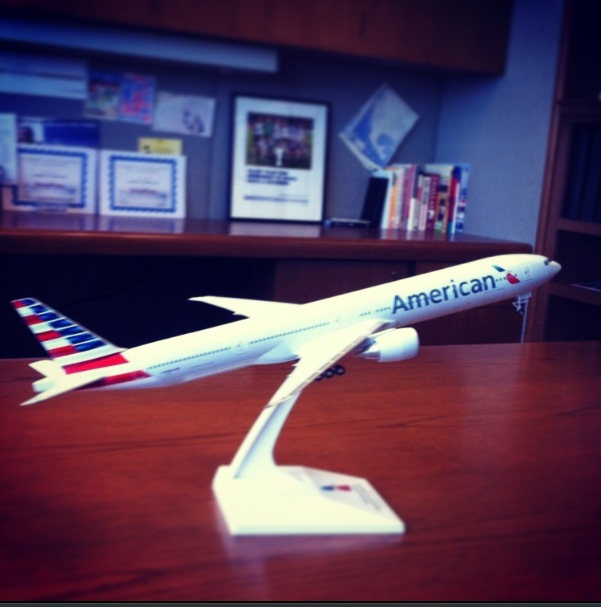 Just to be a smart aleck… I can win a trip or win one for my desk? No thanks. I don’t let my desk travel without me.